A new agreement ends a lengthy dispute over the legal status of the inland sea, according to Bloomberg. "Caspian Sea agreement set to boost pipelines"
Five Caspian Sea states have reached a breakthrough agreement on sovereign rights to the sea, paving the way for new oil and gas extraction, and pipelines, after more than two decades of disputes, reports Bloomberg. The treaty ends a disagreement over whether the Caspian is a sea or a lake, granting it special legal status and clarifying the maritime boundaries of each surrounding country. It also allows each to lay pipelines offshore with consent only from the neighbouring states affected, rather than from all Caspian Sea nations. “Many years of thorough work have culminated today in the signing of the Convention on the Legal Status of the Caspian Sea,” Kazakhstan President Nursultan Nazarbayev said on Sunday in the coastal city of Aktau, as broadcast by Rossiya 24 television. The five states also signed agreements on trade and economic ties, transportation and fighting terrorism. 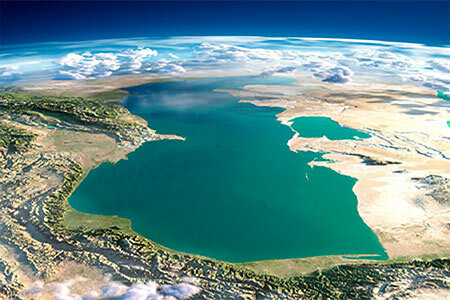 Azerbaijan, Iran, Kazakhstan, Russia and Turkmenistan have tried to define the Caspian Sea’s legal status since the collapse of the Soviet Union, in order to divide up the waters and its natural resources for new drilling and pipelines. The territorial disputes have prevented the exploration of at least 20 billion bbls of oil and more than 240 trillion ft3 of gas, the U.S. Energy Information Administration estimated in 2013. While the treaty “will take us one step forward,” there remain “important issues” to be resolved, Iranian President Hassan Rouhani said Sunday before the summit, as reported by the IRNA news agency. One issue is the distribution of rights to seabed oil and gas deposits, according to Eurasia Group analyst Zachary Witlin. The treaty will also remove a legal barrier to building a trans-Caspian gas pipeline from Turkmenistan to Europe.